New Delhi: All central government ministries and their Public Sector Undertakings (PSUs) were today told to dispense with the requirement of interviews for selections at junior level posts within next two days, however, they may continue with skill or physical test. 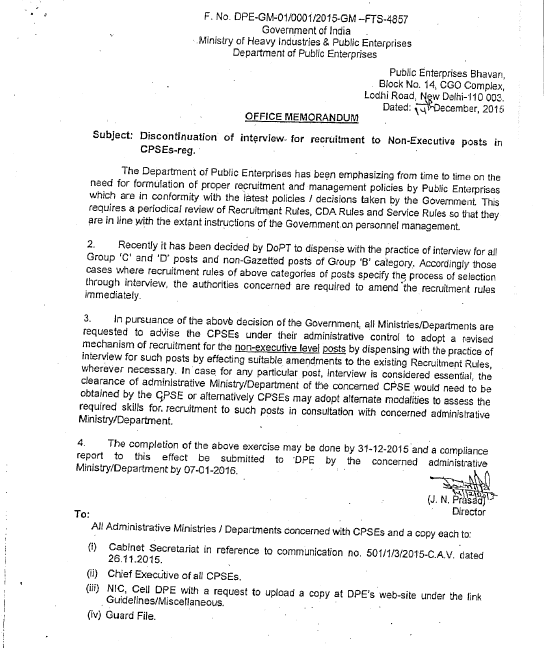 The decision to discontinue interview for recruitments is for all Group C and non-gazetted posts of Group ‘B’ category and all such equivalent posts, the DoPT said. “It is also clarified that as skill test or physical test is different from interview, they may continue. However, these tests will only be of qualifying nature. Assessment will not be done on the basis of marks for such tests,” it said. In case of specific posts where the ministry or department wants to continue undertaking interview as a process of recruitment, a detailed proposal seeking exemption will have to be sent to the DoPT with the approval of the minister or minister-in-charge. The ministries have been asked to send a consolidated report to the DoPT by January 7 in this regard. 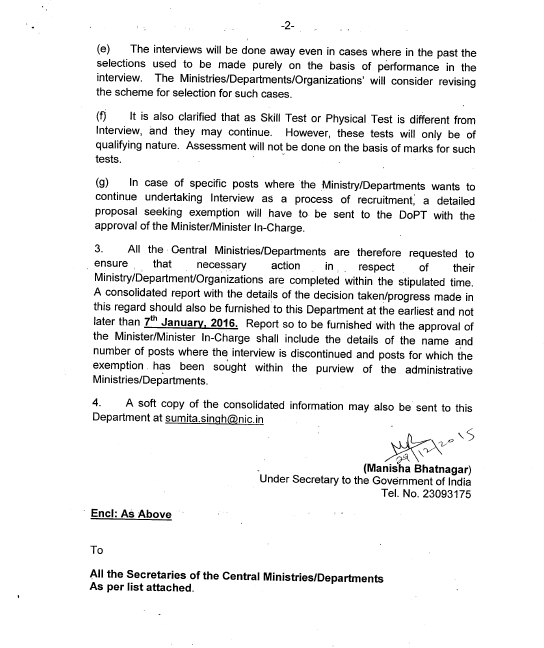 “Report so to be furnished with the approval of the minister or minister-in-charge shall include the details of the name and number of posts where the interview is discontinued and posts for which the exemption has been sought within the purview of the administrative ministries or departments,” the order said. Similarly, the Department of Public enterprises has also asked all ministries to advise PSUs under their administrative control to adopt a revised mechanism of recruitment for the non-executive level posts by dispensing with the practice of interview. A week-long celebration of Good Governance Week was organized by Department of Electronics and Information Technology starting from 25th December 2015. A National event on Good Governance was inaugurated on 28th December 2015 by Shri Ravi Shankar Prasad, the Hon’ble Minister of Communications & Information Technology (MoCIT) in India Habitat Centre at New Delhi. This event involved active participation from Department of Electronics and Information Technology (DeitY), Department of Telecommunications (DoT) and Department of Posts (DoP) and their agencies. Speaking on the occasion, Shri Ravi Shankar Prasad reiterated the commitment of the Government towards the successful implementation of ‘Digital India’ which would help to transform India into a truly digitally empowered society and knowledge economy in the 21st century. He said the government is aiming at empowering people of India through digitalization. Millions of citizens have already joined in this initiative and invited others to do so. He said e-services should reach more people at the earliest and sought cooperation from State Governments, industry and acadmecia in the early achievement of this objective. Sh. Ravi Shankar Prasad also announced that India Post would be launching Payment Banking by March 2017. He said after the successful turn around of BSNL, new initiatives have been taken for improving performance of MTNL. He also announced launch of free incoming all over the Country by MTNL from New Year. The event saw the launch / inauguration of new 23 products / eServices. · Inauguration of Wi-Fi hotspots at Har ki Pauri, Haridwar and Dargah Sharif, Ajmer. · Announcement of Pan India Free Incoming Roaming Facility for MTNL Customers. · Launch of Post-Terminals (Rural ICT - RICT) – handing over Post Terminals to rural Post Masters. * The detail on each of 23 new products / eservices is available at the Digital India Portal (www.digitalindia.gov.in). What's more, 40 ministries, including social justice and 48 departments held back the information sought by Chennai based scientist E Muralidharan under the Right to Information Act. Among the departments that have not provided any information is ministry of human resources, which is a major employer of group A employees like professors in IITs and other central educational institutions. A closer look at the data indicates that there is not a single OBC Grade A officer in the President's secretariat; less than 9 percent of the 651 Union Public Service Commission (UPSC) staff is from the OBC category. The higher education department employs only 5 percent OBC in Grade A officers and 10 percent OBC staff. New Delhi, Dec 25 (PTI) Applications for majority of services like birth or death certificates will soon be simplified and converted into one-page form format, the government announced today. Union Minister Jitendra Singh also unveiled a single-page application form for pensioners on a day being observed as good governance day which coincides with the birthday of former Prime Minister Atal Bihari Vajpayee. "For different schemes you have voluminous forms. Today, we are releasing one-page application form for pensioners. We plan to convert all multi-page or voluminous forms to single-page within a year," he told reporters during a press conference here.ingh said the aim behind this initiative is to make the forms as simple and small as possible for the beneficiary. "There should be relevant and minimum information asked for in an application form for government services and not repetitive ones," he said. "Every month we will be holding meetings with at least two central government departments and reviewing forms available for different services under them. Efforts will be to simplify the whole procedure and we hope to achieve the target of single-page form for all government services within a years time," the minister said. The Department of Personnel and Training (DoPT) has taken various initiatives during the year 2015. These initiatives aim at working in the direction of larger public interest and to establish accountability and transparency. In a landmark decision, the Government scrapped Interviews for recruitment to lower posts wherever it could be dispensed with. 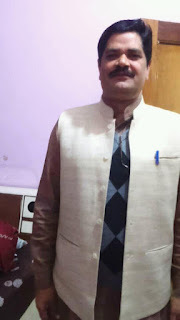 This was followed by the Minister of State for Personnel, Public Grievances and Pensions Dr. Jitendra Singh writing D.O. letters to Chief Ministers of all States in September to take the lead in carrying forward this initiative with respect to State Government jobs. The discontinuation of interviews will not only be in larger public interest but would also offer a level playing field and benefit youth hailing from the lower socio-economic strata. Interviews will be dispensed with for all Group C and Group D posts which are now reclassified as Group C posts. Interview would also be discontinued for non-gazetted posts of Group B category. The process of doing away with interview for these posts will be completed by 31.12.2015. 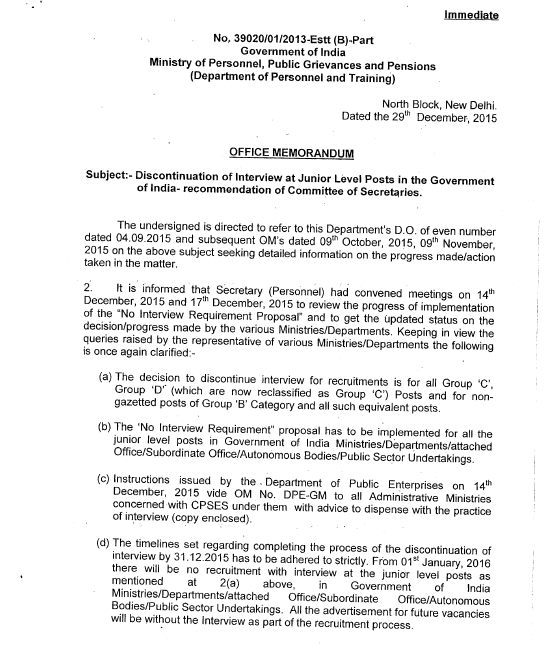 In those cases pertaining to non-gazetted Group B posts and Group C & D posts, where Recruitment Rules specify the process of selection which includes conduct of interview, the Ministries/authorities concerned will take necessary steps to carry out the requisite amendment to the Recruitment Rules immediately. Necessary directions have also been issued to the Staff Selection Commission in this regard. In a big relief to the common people, the DoPT discontinued the practice of submission of affidavit by the family members of deceased Government employees for the appointment on Compassionate grounds. Now they are required to submit self-declaration at the time of applying for compassionate appointment. It will ensure fast process of compassionate appointment and help family members of deceased Government employee immensely. For the first time in the history of the Indian Administrative Service (IAS), the Officers of 2013 batch of IAS were posted as Assistant Secretary in the Central Secretariat for a period of three months. Exposure to Central Government functioning will provide insight into policy formulation at the Centre to these officers. These officers left for their field posting with a macro picture of such policies which will help them in effective implementation of the schemes keeping citizen at the centre. In another novel initiative, the DoPT has started Yoga camps for the Central Government employees and their dependents. The Yoga training sessions are conducted in 29 locations (26 Samaj Sadans of Grih Kalyan Kendra and 3 other places) in Delhi and 12 Samaj Sadans of Grih Kalyan Kendra outside Delhi. Approximately 1900 individuals are benefiting from this scheme per day. With this initiative, the employees would be able to de-stress themselves and also take control over various lifestyle diseases like obesity, hypertension, Hyperglycemias etc. The healthy & happy employees would be able to perform more effectively in their office work. The Department has also started an innovative scheme for the training of the cutting edge level employees of the State Governments. In the first phase, masters trainers are being trained by the ATIs in collaboration with DoPT. These trainers will impart training to the field level employees. Emphasis of the training will be on citizen centricity. Pilot projects had been started in Maharashtra, J&K and Tamil Nadu. It has now been extended in other States. Training will bring an attitudinal change in these employees which in turn will result in increased citizen friendly environment in the field offices. DOPT also exempted the parents of differently abled children from the mandatory transfers so that they can take proper care of their differently abled child. This move will ease the pain of these parents and ensure care and upbringing of these children. A weekly one hour in-house training programme for its employees was started. Three modules of the training programme have been completed and the fourth module is currently running. The employees are imparted up-to-date information on various aspects of day to day work in the office. This gives an opportunity to the employees to clear their doubts and the input given in the session is found very useful for them in discharging their duty more accurately, efficiently and effectively. This has speeded up the rate of disposal of work and the ultimate beneficiary of the same are the citizens. The scheme of interaction of Officers with School Students has been launched in which the Officers of Government of India visit Schools and share their experiences with the School Students. As a pilot, the Senior Officers of DoPT have visited Kendriya Vidyalayas in Delhi and interacted with the students. The interaction of Senior Officers with School Students will have a long lasting impact on their impressionable minds. They will also get a glimpse of the functioning of the Government. The ratio of minimum and maximum pay (Secretary level, not Cabinet Secretary) was 1:10.66 in 4th CPC. Further it was 1:10.19 in 5th CPC and 1:11.42 in 6th CPC. 7th CPC has extended it to 1:12.5 whereas it had been recommended in previous Pay Commissions the ratio of minimum and maximum pay should not exceed 1:8. The pay scale of officers of Secretary level has been recommended Rs 2,25,000/- and minimum pay has been recommended Rs18,000/-. Subject:- Minutes of Meeting of Standing Committee of National Council (JCM) Staff Side held on Friday, the 9th October, 2015 under the Joint Chairmanship of JS(AV), DoP&T — regarding.he undersigned is directed to forward herewith a copy of the minutes of the Meeting of Standing Committee of National Council (JCM) Staff Side held on Friday, the 9th October, 2015 at 1500 hours in Room No. 190, Conference Room, North Block, New Delhi under the Chairmanship of Joint Secretary(AV) for information and necessary action. 3. 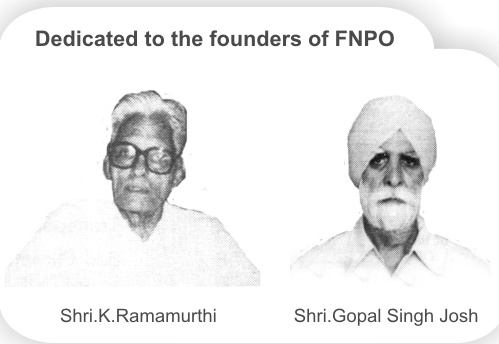 Initially, the finalisation of meetings of National Anomaly Committee meetings held on 29th May 2015 and 9th June 2015 under the Chairmanship of JS(E) was taken up for discussion. It was noted that the draft minutes of 29th May and 9th June 2015 were drafted by the Official Side and sent to the Staff Side for their perusal and concurrence. The Staff Side had proposed certain suggestions/amendments in the NAC meeting minutes. On those suggestions/ amendments, the views of Department of Expenditure, Ministry of Finance had been obtained and the minutes are now ready for finalisation. The Staff Side expressed their concern about delay that had taken place in finalisation of these minutes. They suggested that as per past practice, a meeting may be convened in DOP&T to discuss the draft circulated by the Official side and the suggestions/amendments made by the Staff Side. It was decided that a meeting would be convened by DS (JCA) shortly with the Staff side to finalise the minutes of meeting of NAC held on 29th May and 9th June 2015. As regards merger of DA with pay, the existing emoluments’structrure is based on the recommendations of the 6th Pay Commission which made a specific recommendations against merger of DA. The Official Side, therefore, clarified that at this stage it will not be possible to examine any of the four demands listed in (a) to (d) above. (k) No outsourcing; contractorisation; privatisation of governmental functions; withdraw the proposed move to close down the Printing Presses, the publication, form store and stationery departments and medical stores depots. The Staff Side informed that Ministry of Urban Development has fixed a meeting on the issues raised by them concerning that Ministry. The Staff Side was requested to discuss the issues concerning Ministry of Health & Family Welfare with them separately. The Staff Side submitted that due to non holding of regular meetings at the Departmental Council levels, even smaller issues which can be sorted out through negotiations, are being taken up in various Courts, thereby resulting in a number of court cases to be defended by the departments/Ministries. They suggested that the institutional mechanism of Departmental Council meetings, Standing Committee meetings and National Council meeting may be revived so that there is continuous interaction between the Staff side and the government.